The Admin By Request mobile app is a free supplement to your portal login. You can do the same things - and more - using your portal login, but the mobile app makes data much more accessible to you. Most likely, you and your colleagues will only be using the mobile app on a daily basis and only use the portal to extract extended data, configure settings or do administration of user logins. Below you can see a select collection of various app screens. Click the download icon under the screenshots on your iPhone, iPad or Android device to download the free app. Read on under the phone screenshots for more information. If you log into the portal with your licensed or trial login, you will see the auditlog as a top menu. The auditlog is where you can see data from administrator sessions on clients. The audit log is also available in the mobile app, where it is easy to identify potential violations by simply scrolling through the list. Unless the feature is disabled, the user must to supply a reason for the administrator need. The user is also presented with a Codes of Conduct screen (if configured) explaining penalty for mis-use. In the first screenshot below, Eva Ward installed Visual Studio, which is consistent with the reason, she gave. But she installed the licensed version. If the company hasn't licensed visual studio, this might be worth investigating. When clicking a line, a detailed screen will appear. The details screen shows all administrator session data, including the reason the user supplied, which software was installed or uninstalled and which applications were run UAC elevated. In the last screenshot above, we can see that Payton supplied the reason being a need to install Adobe Reader, and this is in fact consistent with, what she actually did. If you have approval mode on, your pending, approved and denied requests will appear under the "Requests" menu until the request times out (after a week) or the session is started. If you click a row and go into the details view, you can approve or deny the request. 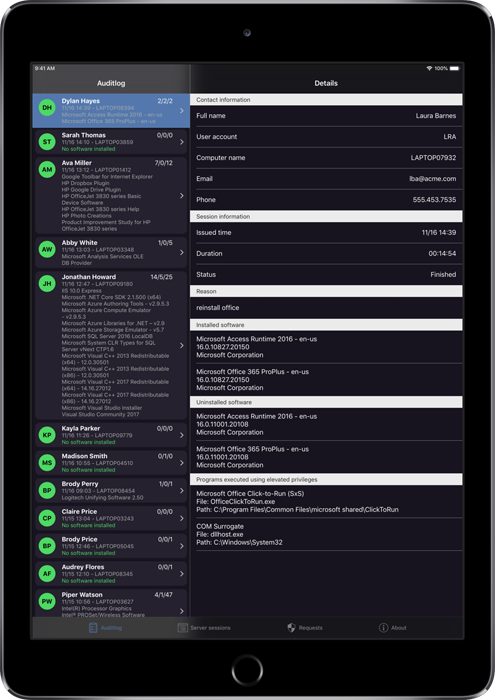 The second a user hits the request submit button on a client, your phone(s) will get a real-time push notification, as shown on an iPhone below. If your iPhone has 3D touch, you will see the third screenshot below right away. If not, you have to swipe left and click "View" first. On Android, the message is similar and does not require the same unlocking to press the Approve or Deny button. If you have paired your iPhone with an Apple Watch, your push messages will also appear on the watch in real-time. Not only is it a great service to the user to often get a real-time approval, it is also very easily done by you. If approved right away, the user receives an email notification back and the delay for approval for the end user can be limited to seconds. If multiple approvers approve or deny the same request, it's a first come, first serve. You can see in the details view, who approved or denied a request. You can also set up email notification in the portal, in case some approvers do not use the app. These approvers will the receive an email link directly to the portal page to approve requests. If you have licensed the Server edition of Admin By Request, you will see a bottom menu named "Server Sessions". This list is similar to the auditlog, except that it shows data on administrator sessions on servers. When you log into the portal, you have a top menu named "Logins". Here you can create more user accounts with different roles. For each user, you can decide, if the user can view the auditlog and/or approve requests. An IT manager could get an auditlog access, which in reality would be a read-only view of what's going on. An IT HelpDesk employee or Systems Administrator should be granted the rights to approve requests also. If you use an iPad to view data or approve requests, the app adapts to your iPad view both horizontally and vertically. To download the app for iPhone, iPad or Android, please click the appropriate link under the iPad image below.